Most of these photos were taken in and around the Orchid at Mauna Lani Resort on the north Kona coast. 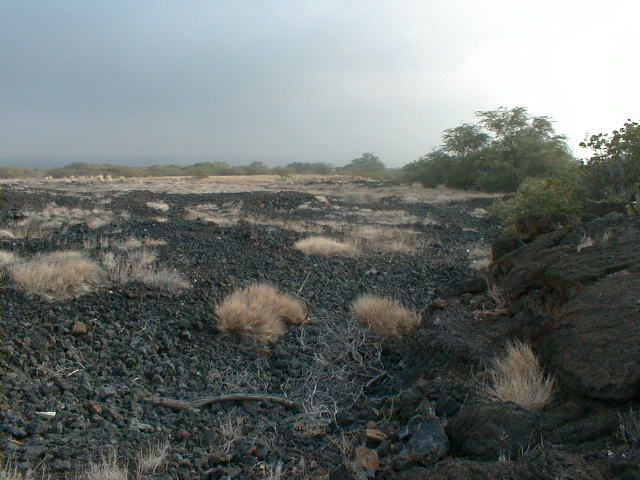 The Mauna Lani resorts inhabit prehistoric Mauna Loa flows, mostly a'a. 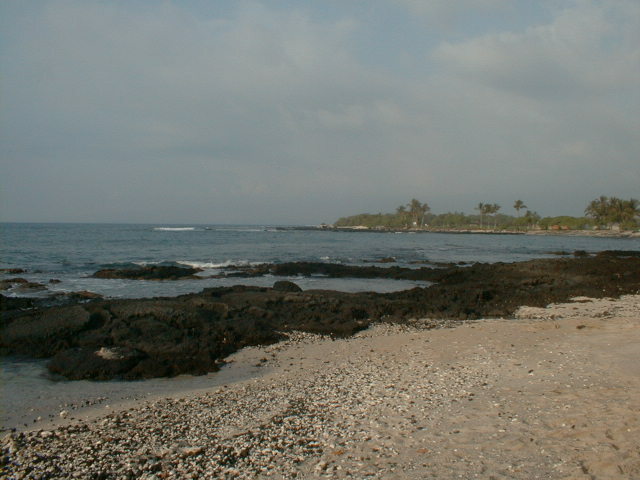 The June, 2000 photos were taken a few miles south at the Kona Village resort, which is flanked on the north by 1801-1802 Hualalai flows, again mostly a'a near the resort. 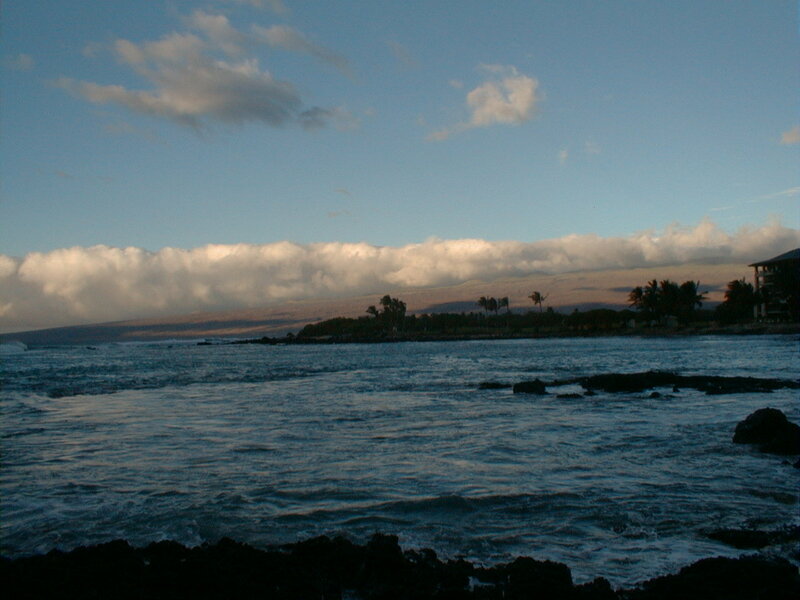 Hoped-for views of the Mauna Loa, Mauna Kea, Hualalai and Kohala volcanoes proved few and far between in January, 1999 due to constant vog ("volcanic fog") from the ongoing eruption of the Pu'u O'o vent at Kilauea. The vog was less apparent in June, 2000, and Maui was readily visible across the 'Anenuihaha Channel most days, but the main peaks were often clouded over on both islands. Bring lots of money. Prices here are sky-high, but the accomodations and service are top-notch. Bring your appetite. The food at the Orchid was fabulous. Rent a bicycle to escape the never-never land of resort life and head for the Mauna Lani Historic Preserve and the Puako Petroglyph Park for a little regrounding. 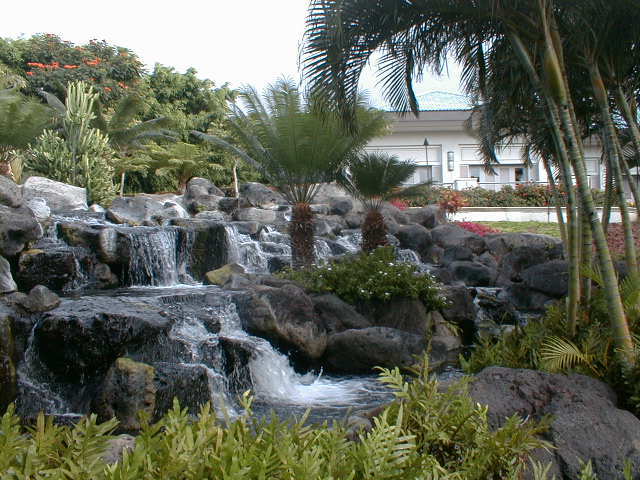 65 KB A garden waterfall at the Orchid at Mauna Lani, formerly the Ritz-Carlton. The gardens were breath-taking. 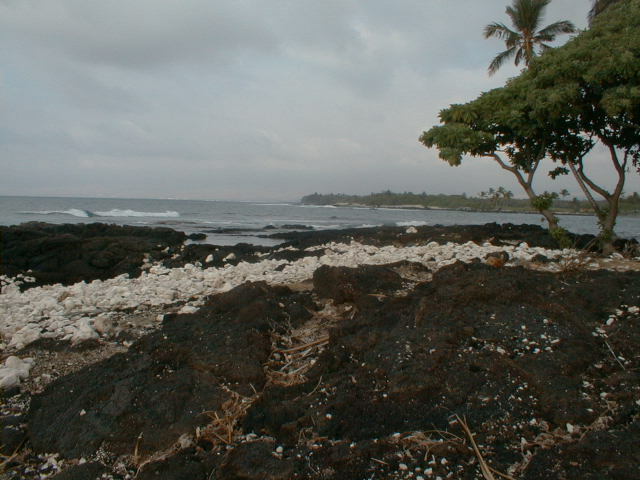 59 KB Looking north along the Kona coast at the Mauna Lani resort area, a wave-cut bench in prehistoric Mauna Loa olivine basalt 3,000-5,000 years old. 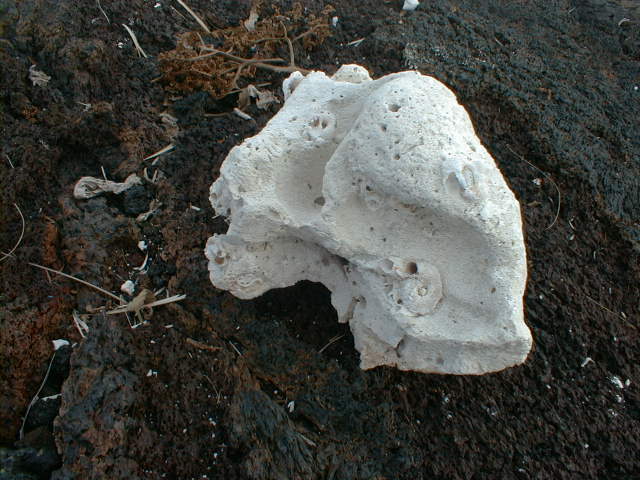 Wave-worn white coral fragments broken from offshore reefs litter the bench. 63 KB A representative coral beach cobble with a partially embedded snail-like shell and worm holes of varying diameters on bed of oxidizing a'a. 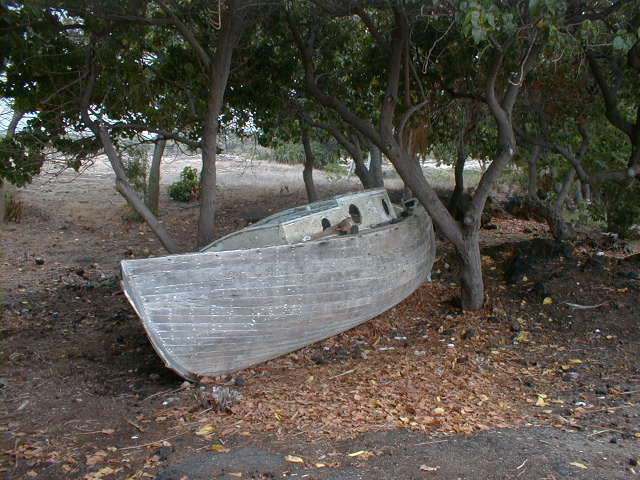 65 KB Bad luck or boat storage? 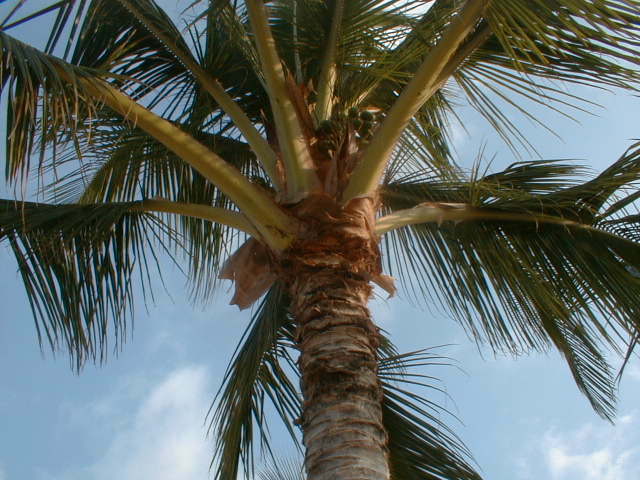 62 KB Coming from North Carolina and California, I'm not accustomed to seeing large deciduous trees at the beach. 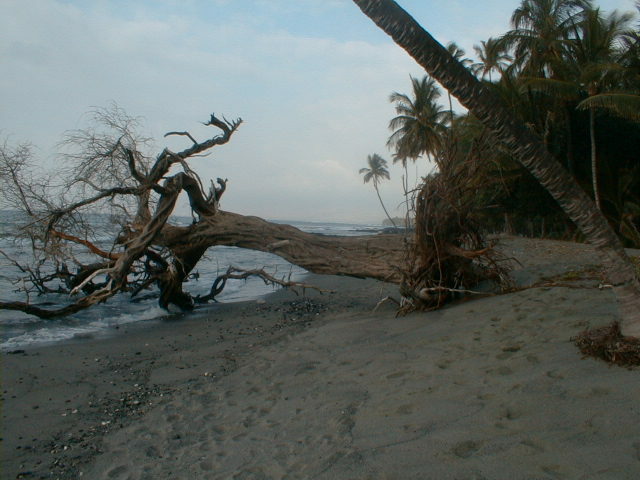 On this day, wave action had concentrated dense olivine crystals weathered from shoreline basalts in a miniature green sand beach just this side of the tree roots. When I returned the next day with ziplock in hand to collect some of the green sand, it had vanished. 64 KB The downflow end of a medium-sized lava tube near the beach, here cut by a stream. 64 KB Vesicles in the roof of the same tube. 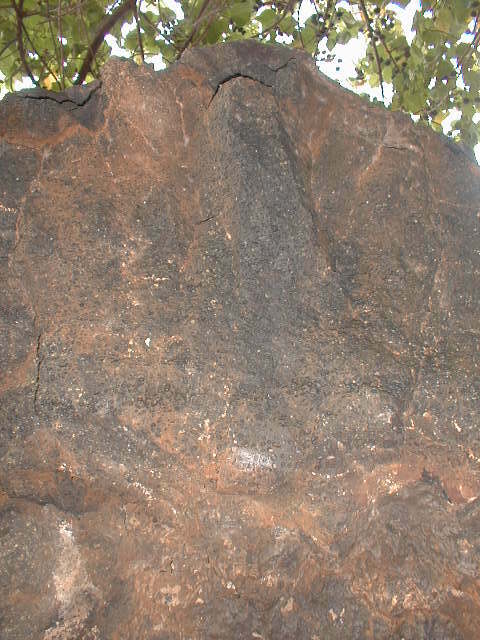 For a spell-binding discussion of Hawaiian basalt vesicles and the story they tell, click here. 62 KB Lavacicles on the ceiling of the tube. 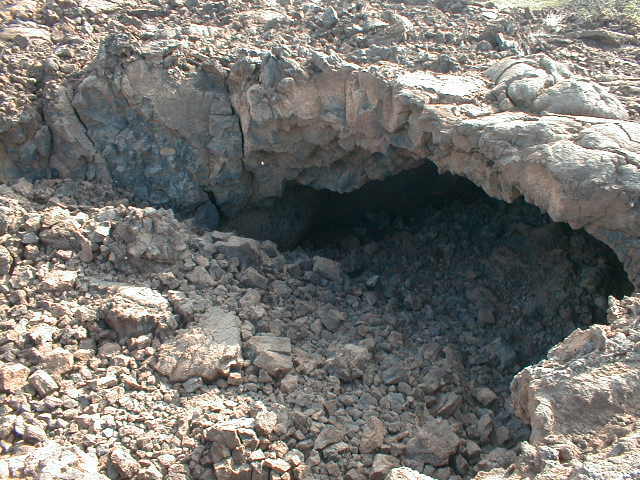 This patch probably formed from spatter as the lava level within the tube began to drop. 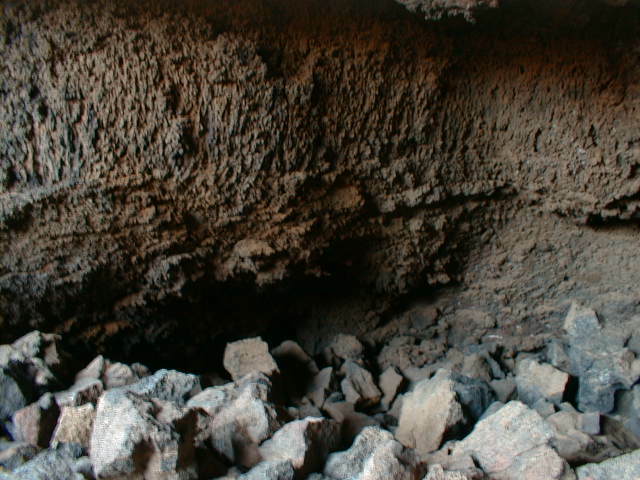 Melting of the tube ceiling on combustion of trapped volcanic gases can create a similar glazing. 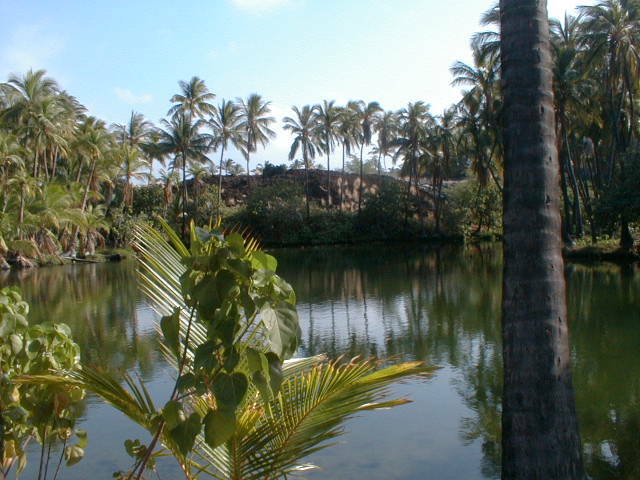 60 KB Dry grasses on this prehistoric a'a flow give away the arid Kona climate the resorts work so hard to disguise with their lush, heavily irrigated plantings. 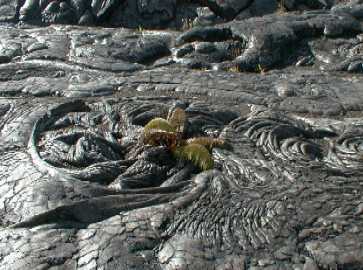 The pahoehoe flow regime can change to a'a downflow but the reverse seldom if ever occurs. 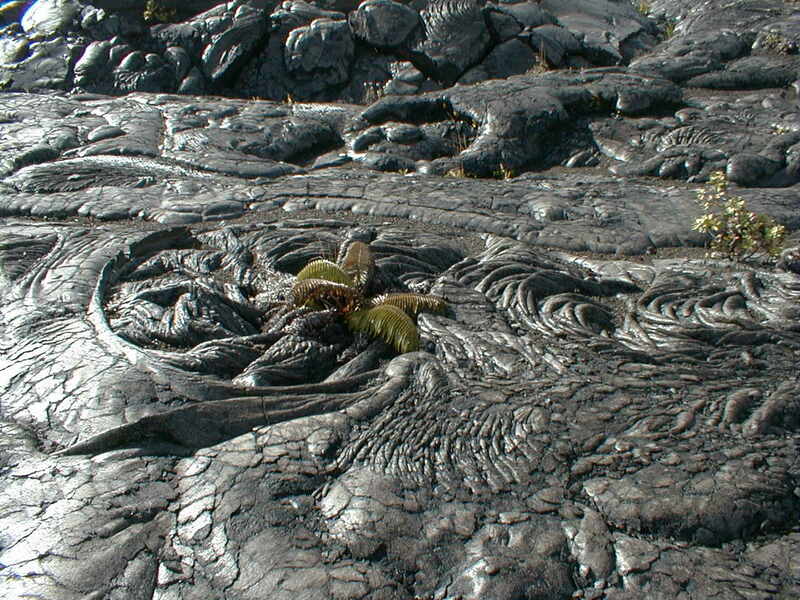 I wonder if the islands of pahoehoe found in this a'a-dominated landscape are breakouts from tube flows passing through the a'a to the shore. 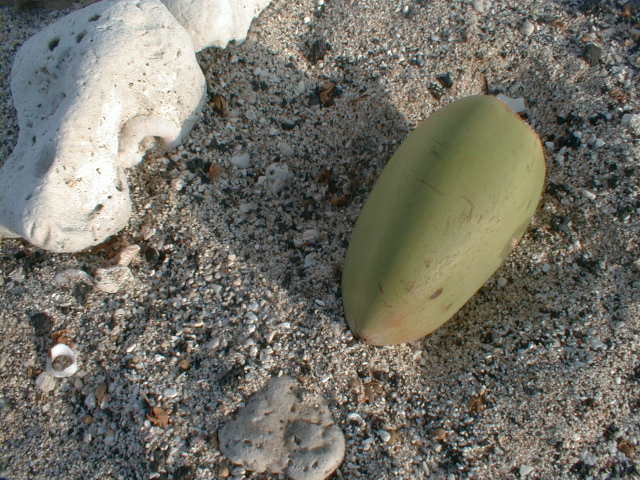 65 KB A small coconut 15 cm long rests on a coarse coral and basalt sand. 63 KB The source of the coconut. 59 KB Coral sand and gravel building up behind a flow acting as a natural jettee or groin. 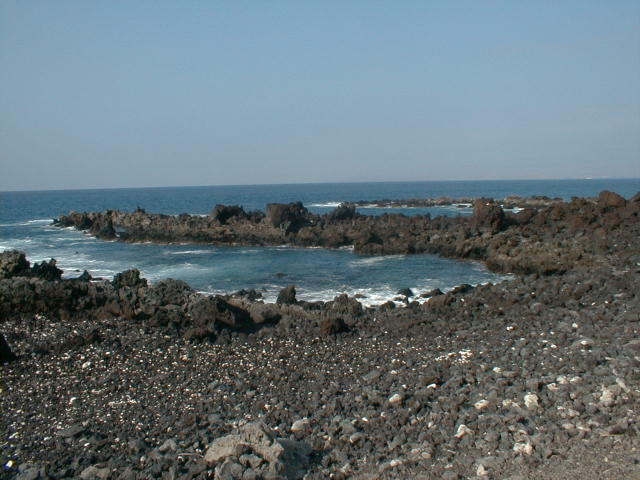 In the stormy winter months, heavy surf removes sand and small fragments from the beach and stores it all just offshore, leaving only the larger cobbles behind. In the summer months, the smaller waves conveniently move these stored loose sediments back onto shore. 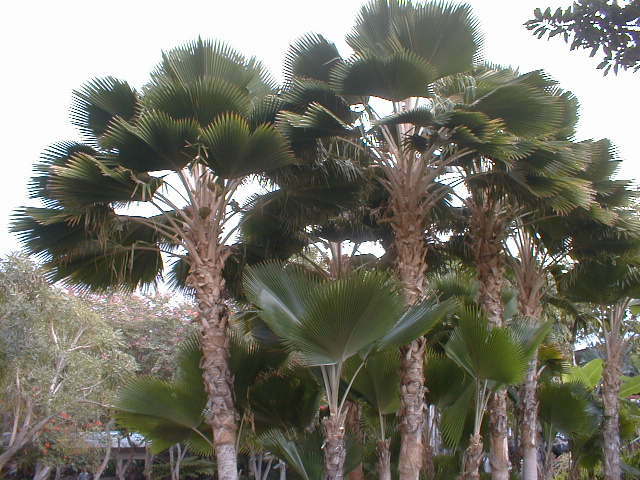 64 KB Elegant fan palms grace the Orchid's garden. 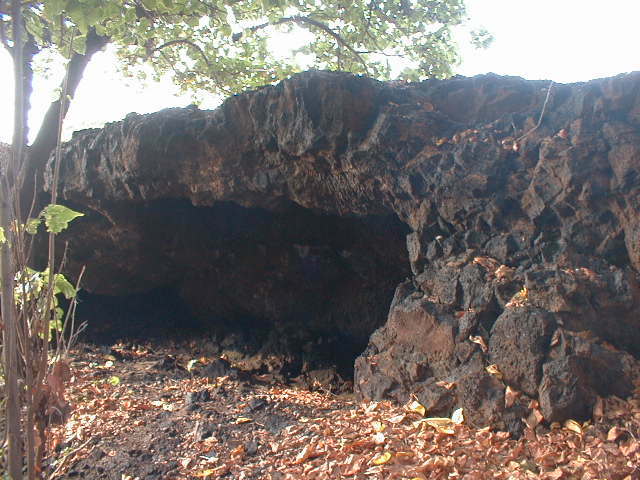 67 KB This large, archeologically interesting lava tube on the Kalahuipuaa Trail in the Mauna Lani Historic Preserve served as a dwelling for native Hawaiians for ~250 years. A relatively high ceiling, flat floor and multiple entrances and skylights all made this valuable real estate at one time. 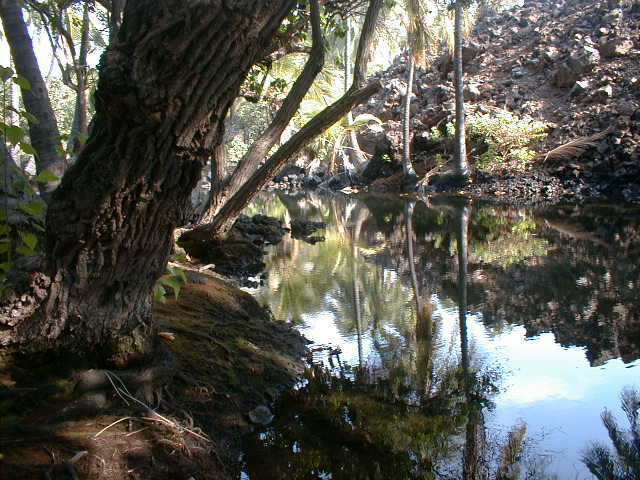 The preserve occupies a weathered prehistoric pahoehoe flow. 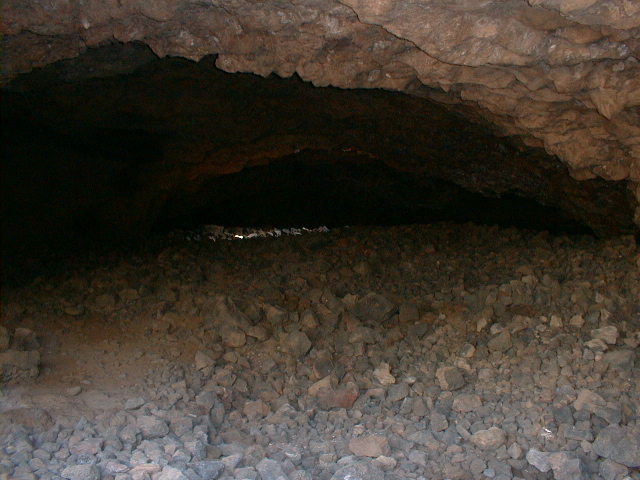 67 KB The same lava tube, looking more to the left this time. The skylight to the right is the one in the next photo. 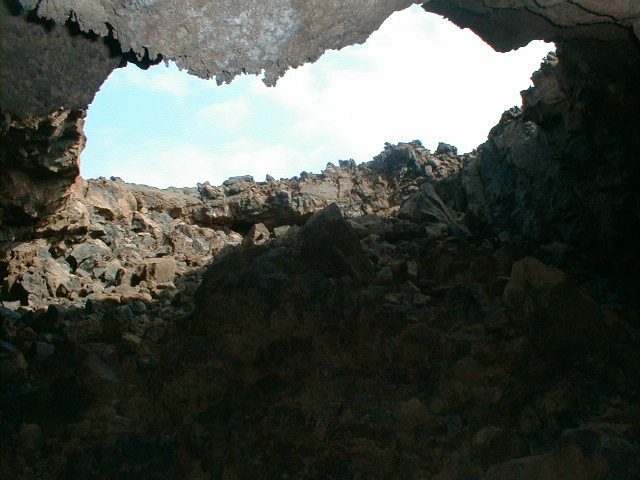 59 KB A lava tube skylight showing several embedded accretionary lava balls. 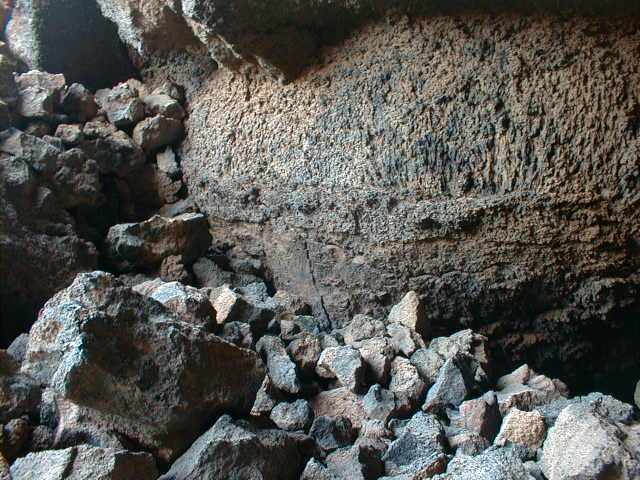 These balls grow as clinkers, levee fragments and other relatively solid lava-proof objects roll down active flow surfaces, gathering material like a rolling snowball. 65 KB The same skylight from the opposite direction, with lavacicles at top center. 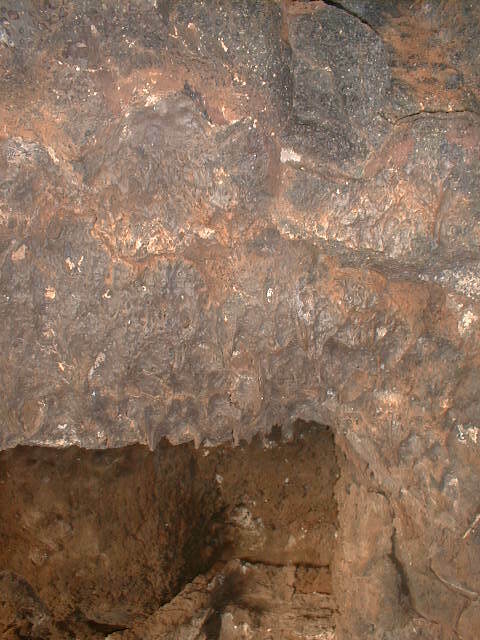 63 KB An oxidized lava tube sidewall, with more lavacicles at top center. 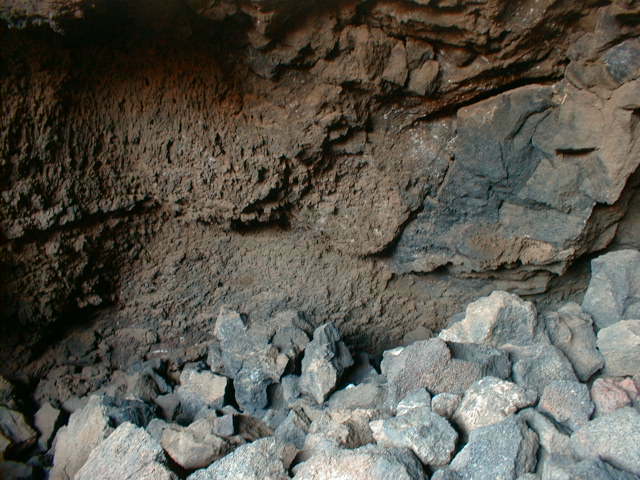 65 KB Lava rings (like bathtub rings) record several lava shorelines within the tube as fragments of the surface crust adhered to the tube walls as the crust washed away. 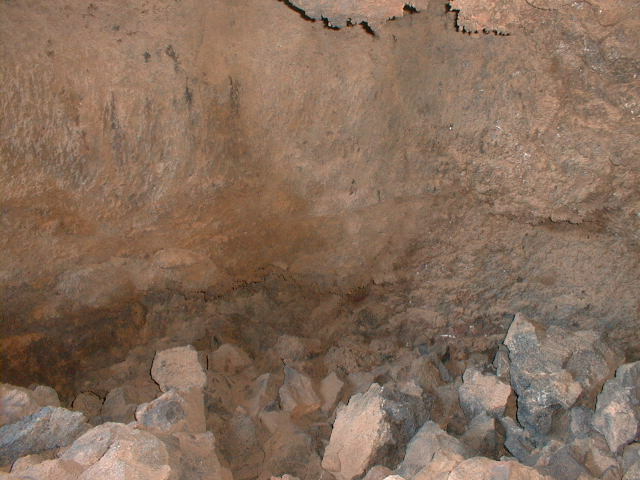 Spatter encrusts this side wall at all levels. 61 KB Here the lava rings continue around an outside bend in the tube. Could the undercut in the sidewall have been eroded by flowing lava, like a cutbank in a stream? 62 KB The lava rings continue downflow. 65 KB Outside the same tube looking in, the arch of the roof becomes apparent. 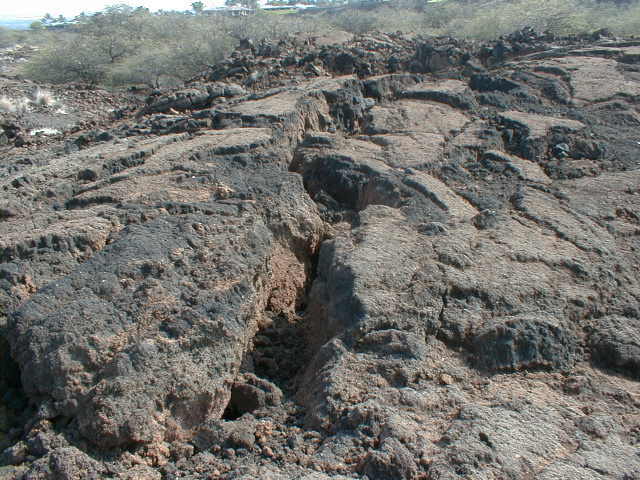 These flows originated near Mauna Loa's summit, probably well above 10,000 ft. Lithostatic pressure (due to the weight of the column of molten lava standing above any given point in the flow) was sufficient to inflate the tube, even with a roof nearly a meter thick. 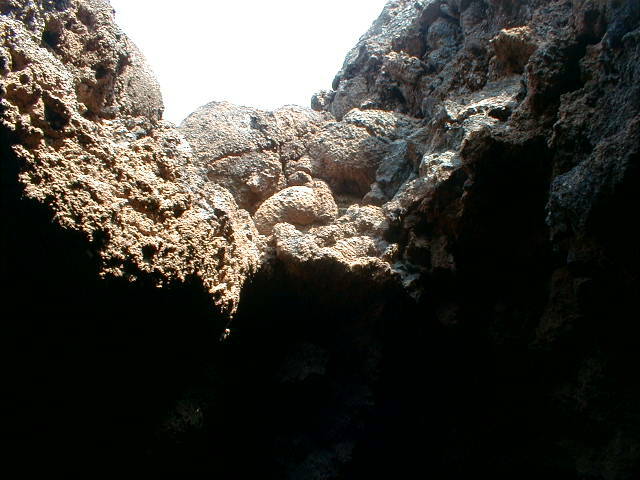 65 KB The axial cracks common in roofs of inflated lava tubes develop when the roof becomes too cool and thick to stretch any further elastically as overpressures in the contained lava continue to elevate the roof. 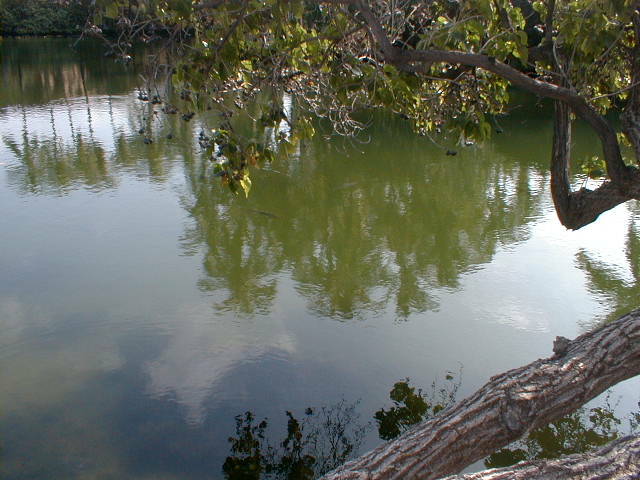 64 KB Looking west from the east end of Hopeala fishpond, one of several linked brackish ponds leading to the shore. 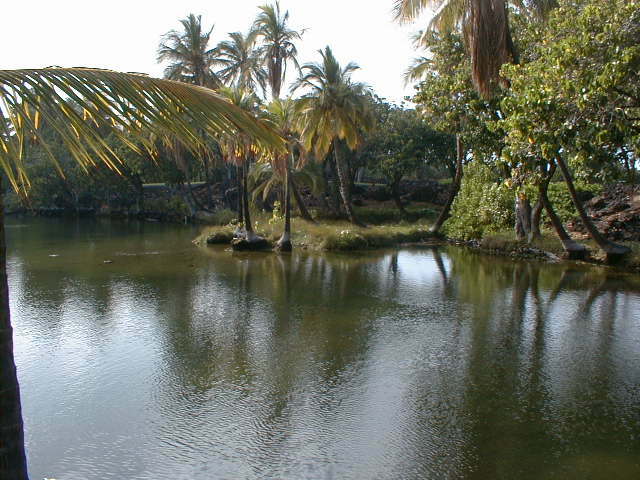 Native Hawaiians operated these oases as fish farms for centuries. 62 KB Looking further to the south on Hopeala fishpond. 61 KB These large fish in Manoku Pond looked 3-4 ft long from shore. 66 KB A shady spot on the smallest pond. 59 KB Another wave-cut bench with little coral along the Shoreline Trail at Waawaa Point. Long an important thoroughfare to native Hawaiian fishermen, the trail is now tightly cramped by a golf course wall. A sign at edge of the golf course proudly boasts of the trail's "preservation", which was no doubt entirely and enthusiastically voluntary on their part. 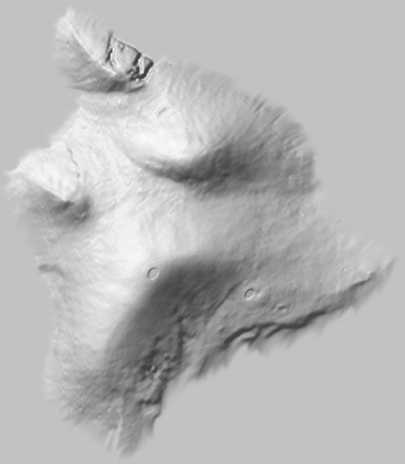 189 KB The grassy green west flank of the 400,000-year-old Kohala shield volcano slopes gently into the sea. 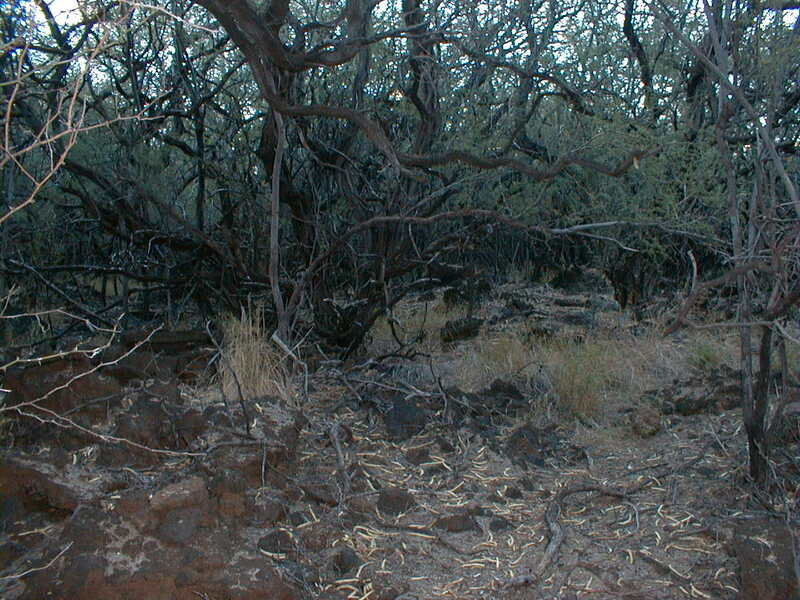 Note the cinder cones lined up on the limb along Kohala's northwest rift zone. 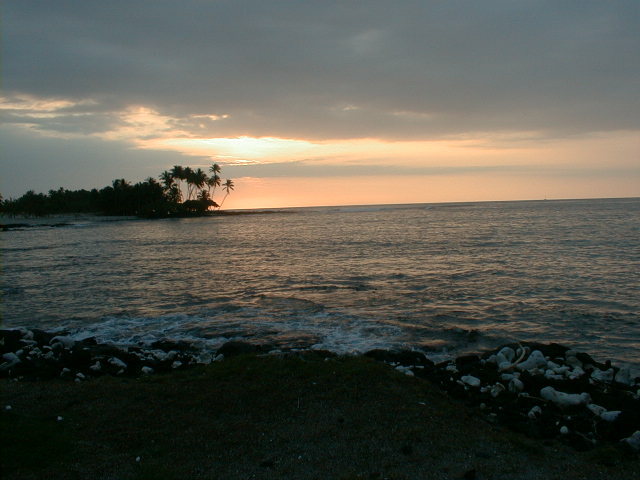 188 KB Sunset over Pauoa Bay at the Orchid. 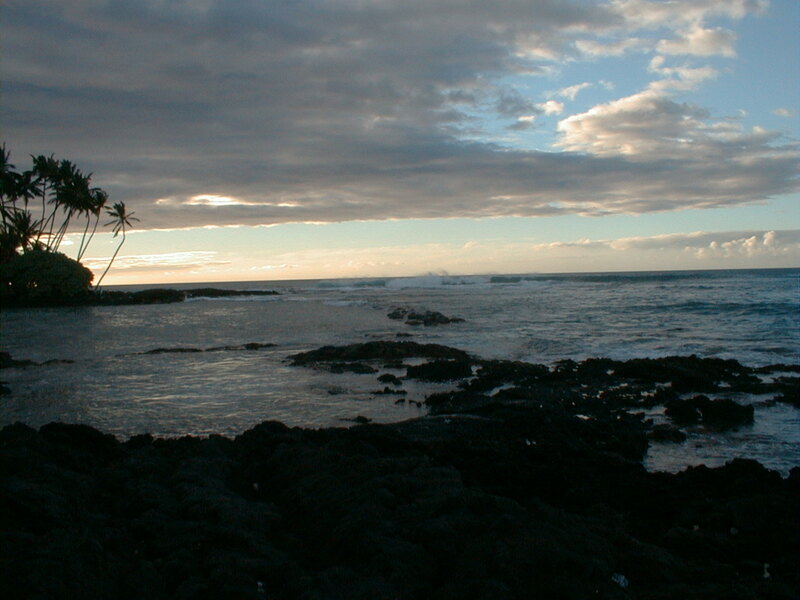 195 KB Kona clouds and waves, also at Pauoa Bay. 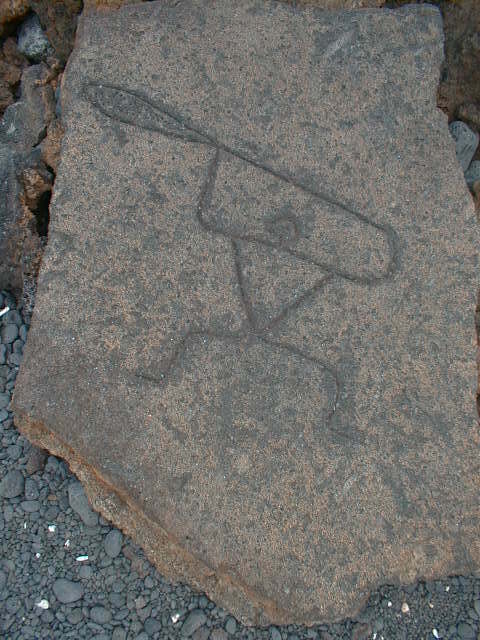 64 KB This handsome petroglyph marked a trailhead in Puako Petroglyph Park near Holoholokai Public Beach Park. Look familiar? 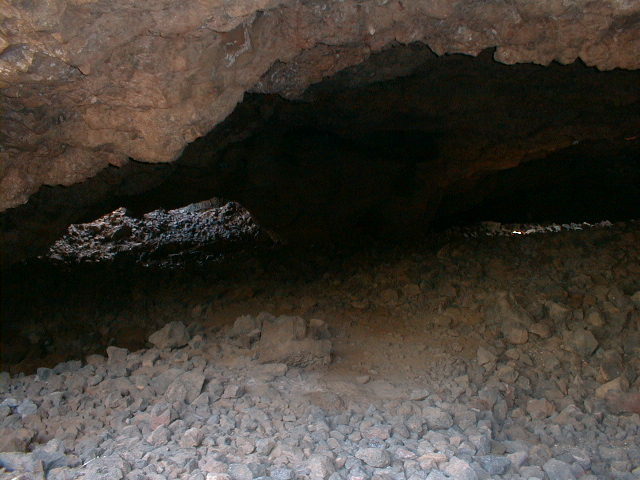 206 KB The lava tube at far right in Puako Petroglyph Park was probably a dwelling. Perhaps the petroglyph in the lower left was meant to guard it. Or perhaps it was a Century 21 sign. 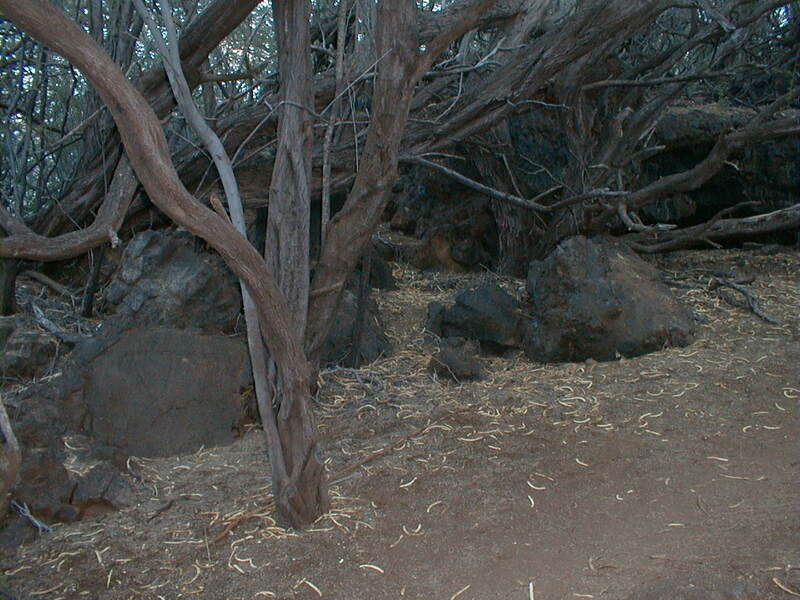 213 KB An ohia forest on prehistoric a'a in Puako Petroglyph Park. 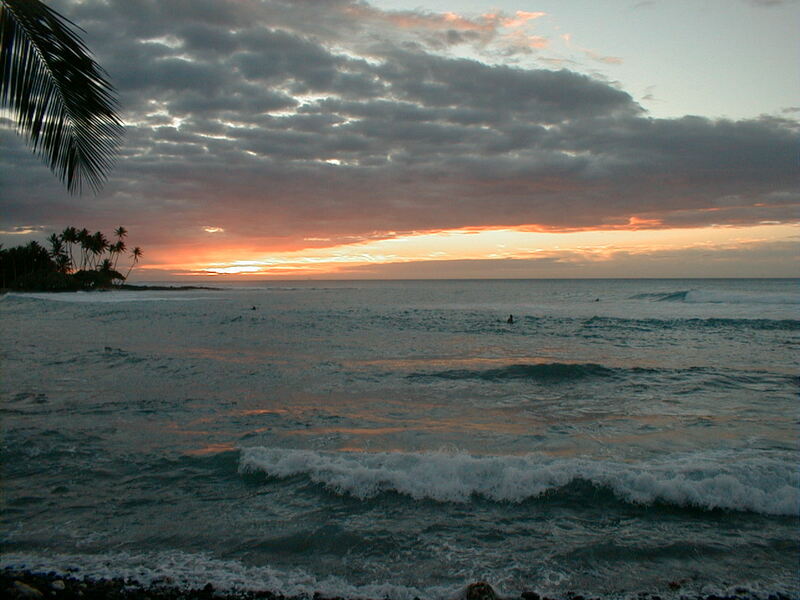 58 KB A storm front graced us with this sunset on our last night at the Mauna Lani in January, 1999.